The start of the AGM was delayed to allow members to vote for their choices of the entries for the Challenge. 13 members had entered 20 items and there was some impressive work on the table. More later. Once the AGM got under way and last year’s minutes had been accepted, Chairman John Holden presented his penultimate report since he is obliged by the constitution to stand down next year. John’s report was quite upbeat and is printed in the summer issue of Your Turn. Alan Sturgess gave a brief update on the Minstead Project followed by the Treasurer’s report. It reflected a stable financial position (they should make him Chancellor) with no increase in subscriptions necessary this year. The Treasurer’s summary and Minstead update are also in Your Turn. Two of the proposed changes to the constitution were accepted as simply tidying up; changing “Emergency” General Meeting to the more usual “Extraordinary” General Meeting and changing references to the “Club” to the “Association”. However the third, to allow just one signature on Association cheques, provoked a heated debate (how refreshing!). The proposal was intended to bring the constitution in line with current practice. Cheques are rarely used now and the bank does not require 2 signatures. It has become normal practice to issue cheques with a single signature of either the treasurer or chairman. The argument against the proposal was put by ex-chairman and a founder member of the Association Brian Hannam. He stated that the 2 signature rule is common amongst small clubs and is designed to protect the clubs against fraud by a single officer and to protect the officers against such accusations. After a lively debate the proposal was soundly defeated by show of hands. The implication for the committee is that the bank should be approached and if they cannot or will not accept the 2 signature rule an alternative will have to be found. Brian suggested the Unity Trust Bank as a possibility. With that, the committee stood down and Chris Davey took over for what has become the formality of election of a new committee. All the committee were prepared to stand and there were no new nominations except Pierre Baumann had been co-opted onto the old committee. So you’ve got us lot for another year. You had your chance. 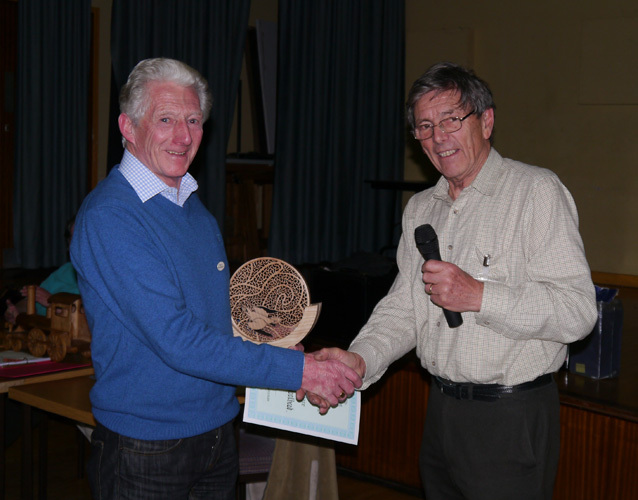 Duly re-elected, John awarded member of the year trophy to Phil Bristow for his work on the website, taking on the visual equipment from Steve and his progress in his turning work. The Les Revell cup for novice of the year went to Alan Baker who was evidently so surprised he didn’t make it in to receive it. Awards of bottles of wine went to all the non-committee helpers. During tea the votes for the Challenge had been counted and Lynda had written the certificates. 49 members voted and it was very close. First choice was Harry Woollhead’s pierced plaque, second was Pierre Baumann’s train and third Jean Turner’s pierced, coloured vase, decorated with beads. 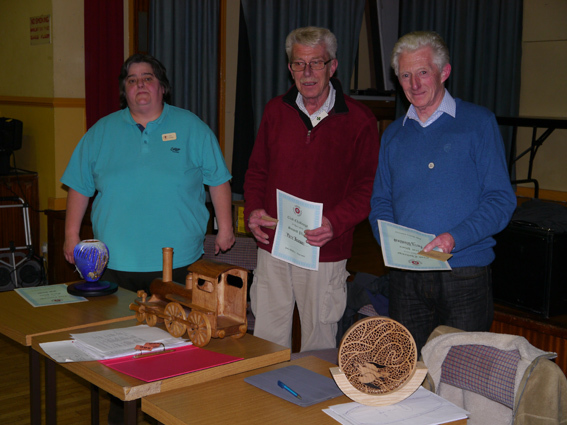 There was time for all the entrants, prodded by John, to say a few words about their entries. The standard of the entries was most impressive and pictures of all of them can be seen on the website.